Seems like a sound basis for a relationship, doesn't it? When two people know that all they need is God, they're free to love each other and never have to say goodbye. Codependency, bad; mutual interdependence, good. Love Bono's lead vocal on this. "It's so cruel, but I don't understand the whole fuss, there are so many pressing issues in Zimbabwe..."
"...— we have water shortages, no electricity, and no jobs — yet people are making noise about a lion?" said Eunice Vhunise, a Harare resident. "I saw Cecil once when I visited the game park. I will probably miss him. But honestly the attention is just too much." If the allegations that this magnificent animal was lured from the protection of a national park to become a hunter's trophy is true, it's horrible. But Zimbabweans struggle to understand why the death of a lion has raised such a furor in the United States. We have a "blue moon" tonight. Thanks to Howard Wilkinson for sharing this. The moon was beautiful last night. First, a little science lesson: Rainbows are formed when rays of the sun pass through drops of rain. The raindrops act as prisms refracting the true colors of the rays. These colors usually fade into white on entry into the earth’s atmosphere. That’s what rainbows are. But it’s often our arrogance as modern human beings to think that if we can describe what something is made of--a rainbow, for example--we’ve described it completely. We think that we fully understand it. But knowing what rainbows are cannot tell us why rainbows are. Fortunately, we can know the answer to that question. It’s in God’s revealed Word in Scripture, particularly today’s first lesson, Genesis 9:8-17. But before we get to the rainbow, we need to first talk about water. The Bible makes clear that, untamed by God or His agents, human beings, water can be a destructive thing. 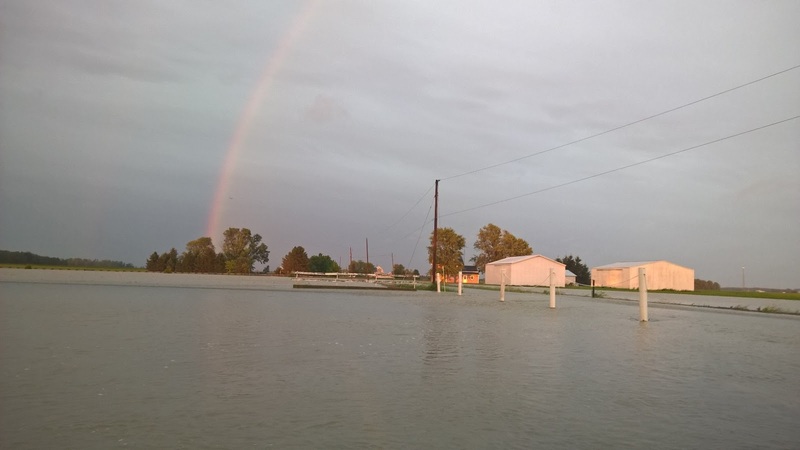 Just this past week, we received this picture from friends in northwest Ohio. It was taken from the front entryway of the church building and that lake with the rainbow over it is the church parking lot. Even worse than that, water filled the church basement, including the kitchen and the Sunday School classrooms. Members of the congregation worked twelve hours just to get it out. Water has its place. It can cleanse and refresh. It can allow for shipping and boating and fun activities. But when water goes where it shouldn’t be, it’s chaos. It was as God the Holy Spirit moved over this chaos that chaos was brought under control and God created what the Old Testament Hebrew called shalom, God’s peace and order, a creation with God at its head, human beings God’s overseers, and a creation that was at peace with humanity and itself. And because human beings were created to be overseers of this earth, Romans 8:22 says that the whole of creation has been groaning to be set free from our sin. That freedom will finally come when the crucified and risen Jesus Christ returns. If it weren’t for God acting on our behalf in Christ, we would have no help from God in this life, no hope from God for the life to come. Jesus Christ bore our sin in His body on the cross and rose from the dead so that all who trust Him as their only help and hope have shalom with God...and will enjoy it perfectly in His new creation in eternity. You and I can thank God for Noah. None of us would have been born and we wouldn’t have the opportunity for a renewed relationship with God if it weren’t for one person who trusted in God. Noah wasn’t perfect; he trusted in God. That’s part of what disciples are, you know: They’re imperfect people who trust in God and commit themselves to live and walk close with God, even when they’d rather walk other pathways. When the world would make it easier to walk other pathways. When they may ache to do what feels like the right thing, but that God says is the wrong thing. Disciples dare to get close to God: to seek forgiveness and correction, to take direction, to soak up God’s infinite grace and love and peace. Noah was one single disciple and God used his faithfulness to change the course of human history. That raises a question for you and me: What plans for His creation does God have that can only be fulfilled by your being a disciple who walks closely with the Lord: who worships with God’s people, studies God’s word, shares the Good News, serves others in Christ’s name beyond the walls of this church? What kinds of disciples will we be? All of us who bear the name of Christ need to answer this question! I pray God will help me answer this question more faithfully in the future than I have in past. God’s plan was simple. He would destroy the whole earth, while Noah and his family and all those animals would be sent by God to the ark. Then God allowed the chaos He had once subdued to fill the world and destroy everyone outside the ark. God let a world that had given itself over totally to evil to experience the consequences of its evil. given all of this...why isn’t God letting this evil generation, of which I am a part, of which we are a part, experience the consequences of our evil or our silence in the face of evil? Why, I wonder, when I consider the evil in me, hasn't God destroyed me, as I deserve? God made a covenant that He would never destroy the entire earth with water. The world will one day come to an end. Several passages of Scripture say that the earth will be destroyed by fire. Many scientists, for different reasons, seem to agree. But why? Why does God show us this grace? Why, I ask when I look at myself in prayer, hasn’t He just given up on me as a bad job, an experiment gone south? The early Church saw the world mired in evil and wondered why Jesus hadn’t returned to establish God’s new heaven and earth. When, they wondered, would God deliver them from this mess? There are some today who misappropriate the rainbow. Some say that it’s a symbol of equality. And while God does love all people equally and seeks all people to come to faith in Christ to be saved from sin and death, God hasn’t made the rainbow a symbol of equality. 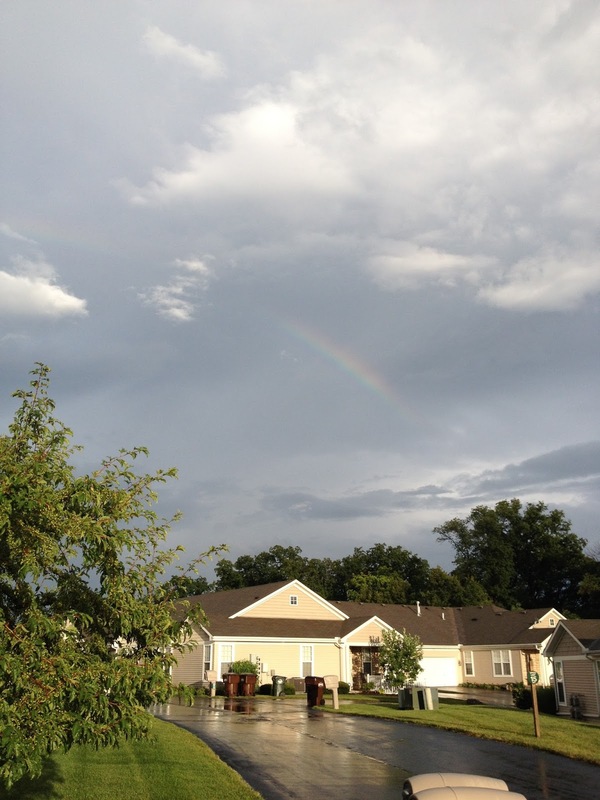 Some even say that the rainbow symbolizes God’s endorsement of sin. Hardly. Sin is serious business. So serious, in fact that the rightful punishment for sin--any sin--is death. But Christ carried the weight of our sin on the cross so that all who repent and believe in Him have the power of sin over their lives removed and have life with God. God doesn’t give the rainbow to endorse our sin. 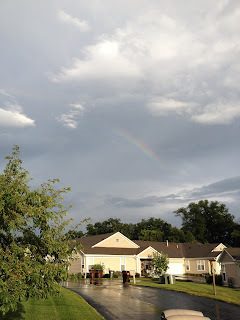 Instead, God says that the rainbow reminds Him of His promises to us. It’s also given as a reminder to those of us who are Christian. It tells us: Don’t give in to despair. God has control of things, even when they seem out of control. And don’t give up on your neighbor, even if he or she derides God and dismisses their need for a relationship with Christ. Listen: If you can be transformed from an enemy of God to a friend of God because of what Christ has done for you and because of your faith in Christ, then your neighbor can be transformed as well. The rainbow reminds us that God wants to deliver all people from the evil of this world, forgive their sins, and give them everlasting life. Our job as disciples of Jesus Christ is to pray for our neighbors, share Christ with our neighbors, serve our neighbor as though they were Christ, give ourselves to the good of our neighbor as if we were Christ. Just as God used Noah, God can use you to bring His life and message to the world. You have the rainbow as His guarantee. But if we love God and still desire the thing for which we've been praying, Hallesby suggests, we should keep praying, even if we've been praying about a particular subject for a long time. We should continue praying with a willingness to accept any answer God gives when it becomes clear to us and with one desire taking an even higher place than the thing for which we've been praying. He says that we should tell God, in our own words and from the heart, "Grant this request only if it will bring You glory." Our one prevailing desire should be the glory of God. One might pray: "This is what I'm seeking, God, for so-and-so or for myself. I could be wrong in asking for it. If I am, I trust You to show me. But for now, in case You're delaying a response in order to orchestrate events or to build my character or someone else's character, until we're ready to receive Your blessing, I keep offering this petition. Your will be done and, please, grant this petition if it will bring You glory." And of course, such a petition, like all prayer petitions, needs to be offered in the name of Jesus, the only way to God's Father heart. Praying in Jesus' name is not a formula for "prayer success." Praying in Jesus' name is an authentic plea on the petitioner's part that what is prayed for will be consistent with the will and honor of God as revealed in Jesus. I like Hallesby's advice. It's Biblical. Jesus commends persevering prayer. In Romans 8, Paul talks about how we don't really know how to pray as we ought, but we're called to trustingly commend our prayers to God, believing that the Holy Spirit can turn them into the God-honoring petitions that, in our spirits, we want to offer. And the Bible teaches that believers are to do all things to the glory of God, not their own. Speaking personally, there are some prayer petitions I've experienced lifting up to God regularly for a decade or more, with no answer. In those petitioning years, sometimes I wondered if I should stop. Or, if my petitions were selfish. Or, if they were trite or deemed unnecessary by God. Or, if I was being immature in offering them. Or, if my petitions would somehow not bring God glory. But believing that there was something God-honoring about them, I kept praying these petitions, all along submitting to God's will and asking God to grant them only if they brought Him glory. When, after years of praying petitions like that--whether, as I say, for ourselves or for others doesn't matter--we finally experience God's positive answers, as I have, it's a humbling experience. You know you didn't accomplish the blessing that could come from God alone and you know that, in this granted petition, God is being glorified. In other instances, I've gotten to the point where I was convinced that I needed to stop praying for some things, that God had said, "No" and I must accept that. And in still other instances---inexplicable, tragic, and sad, people for whom I and others have fervently prayed, have died. The depths of sadness experienced by Christians who lose loved ones or friends after offering desperate prayers is a grief non-believers, with their resignation to the fates of this dying world, cannot understand. It represents one of the most haunting struggles of the Christian life, especially when someone we care about dies and our prayers didn't result in God bringing them healing in this world. We wonder why. Our faith can be shaken. The only things that make such a tragedy bearable are (1) the promise of Jesus, God-in-the-flesh, to be with His people always in our time on earth, sustaining us, bringing other believers alongside us to bring Christ's love to us, AND (2) the promise of resurrection life in God's perfect kingdom for all who turn from sin and trust in Christ as their God and Savior. All of the sadness of this world, all our grief in this world, I believe, will one day be explained in the world to come when we live in the direct presence of God. More than that, we have the promise that God will dry the tears of our earthly griefs; mourning, death, and loss will be gone forever. We will more fully understand the wise words of the apostle Paul, when he says, "I consider that our present sufferings are not worth comparing with the glory that will be revealed in us" (Romans 8:13). But as we continue to live on this earth, I think Hallesby's suggestion stands. You should keep praying that petition that's on your heart. If you seek to be a faithful follower of Jesus and it hits you to pray for something, there's a good chance you should keep praying for it. God may answer the prayer in ways you can't imagine. After all, when we pray, we don't command God as to how He answers our requests; we submit to His sovereignty, to His will. That's why Hallesby tells us that when we're not sure about our petition, but feel compelled to offer it anyway, we should tell God with authentic submission: "Grant this request only if it will bring You glory." I'm definitely in the keep-on-praying camp.